Home » How Long Does It Take? Internal Review: a 12-18 month self assessment period where the organisation reflects on how it performs against the Quality Standards, using an agreed process, for example, through team meetings every week or fortnight, or less frequent ‘brainstorming’ workshops. The outcomes of the discussions are recorded in a workbook called a Quality Journal provided by Te Wana. This period is like a “stock take” of the organisational systems, policies and processes. It provides an opportunity for identifying gaps and developing ideas for improvement and making some of those improvements. It is also an opportunity to note and celebrate identified achievements. Planning and time are crucial. The organisation needs to prepare for the internal assessment, allow people time to participate and plan in advance which standards will be assessed, how and when. Designated people are also provided with training by Te Wana in organising the internal assessment and review cycle process. External Review: a team of 2 to 4 trained peer reviewers visit the organisation to undertake an onsite assessment over 2 to 5 days against the standards. This includes reading the self-assessment workbook, policies and other documents, and conducting group interviews of a range of people involved with your organisation, including community networks. Feedback: a review report written by the review team provides an overview of organisational context, strengths, areas for improvement and gives recommendations and commendations. The report is independently audited, sent to the organisation for comment or feedback and then finalised. 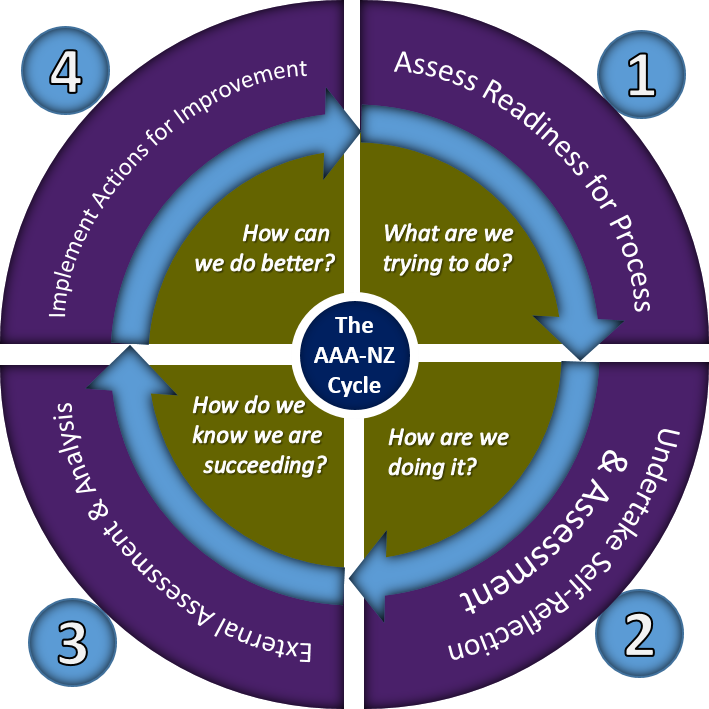 Taking Action-Quality Workplan: the Quality Workplan is an action plan for working through the self and team recommendations of the Review Report. Recommendations identify what needs to be done to meet the Quality Standards and to help an organisation make further improvements. Often many of the review recommendations simply affirm self identified actions from the Internal Review. The Quality Workplan phase is usually about 12 – 18 months, with progress reports made every six months to Te Wana. Demonstrated progress on the Quality Workplan is necessary for proceeding to an Accreditation Review if this option is elected. Accreditation Review: the Accreditation Review is also undertaken by a team of trained peer reviewers and uses similar processes as the Development Review including interviews, document assessment, facility visits. In addition it looks at progress in meeting the recommendations of the Development Review and the integration of a culture of continuous improvement. The self-assessment is updated for any significant changes and specific audit tools are completed, for example, on client records and consumer-community consultation. The review team provides a full written report on the achievement of the quality standards. If all requirements are met, then the review team will make a recommendation for accreditation that needs to be endorsed by the Quality Innovation Performance accrediting body. A Quality Workplan is again developed to act on recommendations from the review team after the accreditation review. Accreditation is a self-assessment and external peer review process used by health care organisations to accurately assess their level of performance in relation to established standards and to implement ways to continuously improve the health care system.